I've watched Manchester United's last five games and three of them I've watched at Old Trafford. 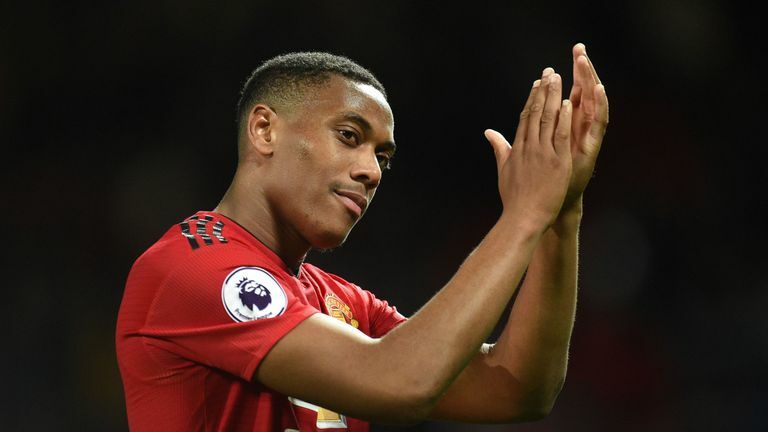 I've had an incredible view of Anthony Martial, watching him closely and thinking how you'd play against him as a right-back. Also, thinking about Manchester United's situation with him and his contract. What do they do? Do they fight for him? Is he worth fighting for? Fans are torn on him and there's never been a player in the last 10 years at United that I've been more confused by in terms of what he is. Normally when you look at a player you think what is he? Do I like him or do I not like him? I can't make my mind up with Martial. Some weeks I think he's brilliant, but other weeks I'm not sure he's a Manchester United player. If you look at his whole career, he's played a mountain of games for someone so young. That's the first thing to say, he's still a very young boy. You wouldn't say there's anything there that's off the chart. He's scored some goals but not at an incredible ratio, particularly not a ratio that you'd say would live with the modern great wide players that we watch in the Premier League and across Europe. Then you start thinking what is he as a player? What does he do well? The things that he does well, he finishes well. He makes difficult finishes look really simple. It was brilliant against Chelsea and we saw another against Everton. He gets into those positions really well. What else? He's got power, he's got pace and when he cuts inside he is a threat. He's positive and he can hit a ball. And when you give him the ball to his feet - just to his feet - he comes alive. He drives at people, he commits people and he's got something about him. What does he need to improve? What drives me crazy about him is his off the ball work. I'm not talking about his defending, forget his defending. I've gone past the point of wide players generally coming back and doubling up and all that. What do they do going forward? The best players I played against as a right-back were better off the ball than they were on it. The runs in behind you, in between centre-back and full-back, were difficult to play against. The best players I played against they caught me. So as I was looking to see where the player was the minute I looked back towards the ball they would be gone. Martial doesn't get that. He doesn't know where to be and when to run at the right time. He hasn't got any timing in his off the ball runs. What Martial tends to do is wait and wait and hangs wide. He needs to change that. The difference between him scoring 10 to 12 goals a season and 20 is that movement off the ball. He very rarely does it off the ball. He very rarely makes that hurt run that really damages a team. It's a tough run to make and you don't always get it. He doesn't quite know when to run or where to run. He doesn't quite understand the game. Jose Mourinho has to take responsibility for his players but Didier Deschamps has dropped this boy over the last 12 months. I never saw him making those off the ball runs under Louis van Gaal either. It's not just a Jose Mourinho thing. This boy's pattern of play has been set for three years. He's a massive talent but under three managers now, Deschamps dropped him before the World Cup and picked Thomas Lemar, Ousmane Dembele and Kylian Mbappe. Jose Mourinho and Louis van Gaal have both had him in and out of the team and I'm torn on him. What I started to do was look a bit deeper into the stats of Martial and I got the shock of my like. When you look at the stats equivalent to a full season of Martial he's actually matching the likes of Sadio Mane and Eden Hazard in terms of minutes played, goals and assists, and that's incredible. Then you say to yourself what am I watching? It confuses me even more because they are incredible stats. I looked at his physical stats against the players on the list and again I got the shock of my life. I got to the point where I thought that's why Deschamps, Mourinho and others don't fancy him. When you look at the players in and around, as we did before, Mane nearly runs 2km more than Martial. Hazard, who gets accused of not working hard, is 1.5km more than Martial. We're not talking about defending or anything like that, Martial is well down on his physical stuff. The conclusion that I have come to is that the easiest thing to fix is those running stats. The easiest thing for him to fix is for him to understand how to make that run in between full-back and centre-back. 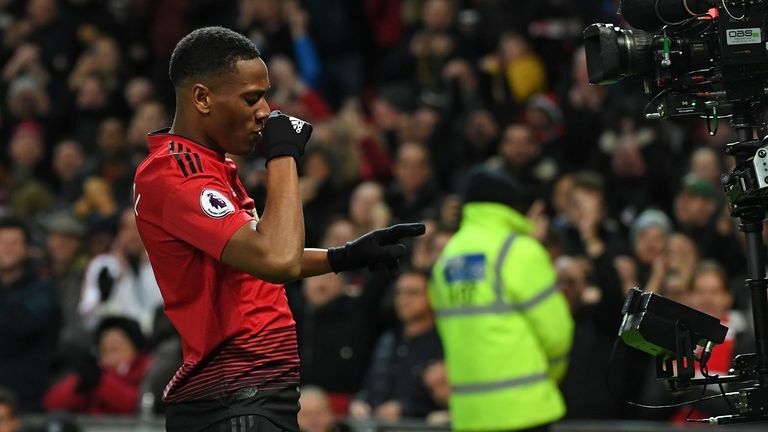 What it gives me is a clear understanding that Manchester United have to show patience with him because actually if you correct those running stats up to above 10km and you get him making those runs in between the full-back and the centre-back, because he can finish he will get up to 20 to 25 goals a season. United have to invest in him, which I'm sure they are doing, but that's where the tension has been. Mourinho's wanted a player who is ready now to win the league now. He is not ready now, there's no doubt about that. However, the club are thinking this kid can actually be something special in the next two or three years. They've got to persevere with him but he's also got to improve himself.